Most profitable education CPA affiliate network! 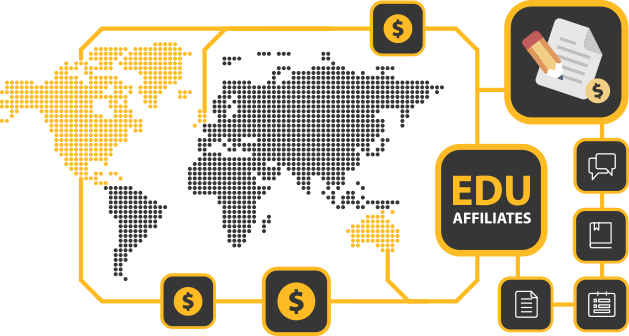 Edu-affiliates.com is an essay affiliate program converting student traffic from English-speaking countries. Most of the traffic we are looking for comes from United States, Canada, Australia, and United Kingdom. Students order various academic papers like essays, research papers, term papers, dissertations, and more. We employ more than 200 professional freelance academic writers to service their needs. We pay the highest rates to our writers and get outstanding quality of work in return. On the other hand, webmasters get a lot of rebills and high commissions, because we have the highest average order price on the market - $130. Let’s say you decided to work with us and got your traffic sources ready to go. To begin with, we’ll assume you send us 300 unique visitors per day. Keywords - good targeted keywords. Based on this the conversion rate would be 3.5-4%. Let’s take 3.5% a minimum. Thus you will get an average of 10 NEW clients per day, or 300 NEW clients per month. Next we will count your prospective earnings for 1 month (30 days). And don’t forget about re-bills - your passive income! On average we have 5-7 re-bills per client. Let’s take 5 as a minimum. of passive income over the next 6 months! And that's your profit for only 1 month! Here, at Edu-Affiliates.com we devote our time towards selecting only reliable partners to work with. We have developed a complex usage tracking system to provide you with detailed reports realtime statistics. Thus you don't have to worry about shaving or other tricks we never do. Being honest with you we expect the same in return. The only thing you have to do - drive traffic. This website and its content is copyright of © Edu-affiliates.com, 2019. All rights reserved.